This month sees the return of the historical Florentine football game, the Calcio Storico Fiorentino, in which the four quarters of town compete in 16th-century historical costumes against the magnificent backdrop of Piazza Santa Croce. The teams are made up of (blue) Santa Croce, (red) Santa Maria Novella, (white) Santo Spirito and (green) San Giovanni. The prize is a white Chianina calf. The matches are always played in June, with the finals held on the Patron Saint’s day, 24th of June. The origins of the “Florentine Kick Game” – Giuoco del Calcio Fiorentino, where calcio simply means kick – are controversial. Some say they originated in the 16th century, the association itself of the Calcio Storico Fiorentino say from ancient times when the Greek were playing the Sfermomachia, later adopted by the Roman army as a training mode. This ball game, known by the Romans as Harpastum, was in fact very violent and involved considerable speed, agility and physical exertion. Undoubtedly this continuous body to body, head to head competition was a huge success among warriors and spread quickly throughout the Roman Empire. Played by two even-numbered teams, it was performed on sandy ground with a large ball stuffed with rags. The aim was to get the ball into the opponent’s field using any means. Maybe the game was imported to Florence in 59 A.D. during the founding of Fiorenza, the historic Florence, by retired Roman warriors and their family. What is certain, however, is that in the second half of the 5th century, this early form of football was widespread among the youngsters of Florence who habitually played it in the streets and squares of town. Apparently it was even played on the river Arno when it completely froze in January 1490. The official rules of Calcio Fiorentino were published for the first time in 1580 by Giovanni de’ Bardi, a Florentine count. As according to those rules today’s game is played on a field covered with sand with a white line dividing it into two identical squares and a goal net running the width of each side. The teams are of 27 players, who can use both feet and hands, and are made up of 4 datori indietro (goalkeepers), 3 datori innanzi (fullbacks), 5 sconciatori (halfbacks) and 15 innanzi or corridori (forwards). Neither the Capitan nor the Alfiere (flag bearer) participate. Tactics allowed are head-butting, punching, elbowing and choking but severely forbidden are sucker punching and kicks to the head. No substitutions are expected. To referee the match there is a Giudice Arbitro (main referee), six segnalinee (linesmen) and, above everyone, a Maestro di Campo (field master) who makes sure everything runs smoothly, stepping in if necessary. The game starts when the Pallaio throws the ball towards the centre line; a small cannon –a culverin to be precise- is fired and ‘hostilities’ are announced. Each game lasts 50 minutes within which the players, using any means necessary, try to get the ball into the opponents’ goal. The teams change sides each time a point, cacce, is scored. 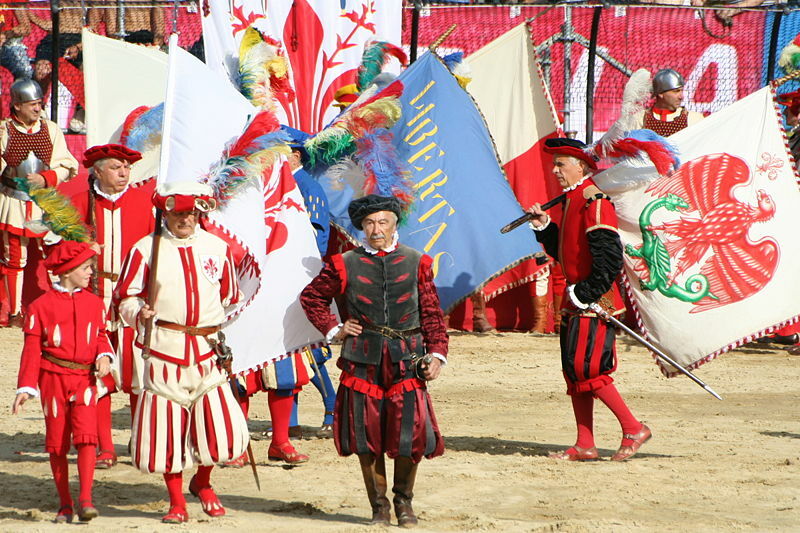 Preceding the final match is an impressive historical costume parade of over 530 participants with strictly Renaissance costumes, in memory of the deeds of the Republic Army, the period during which Florence was governed by the People. 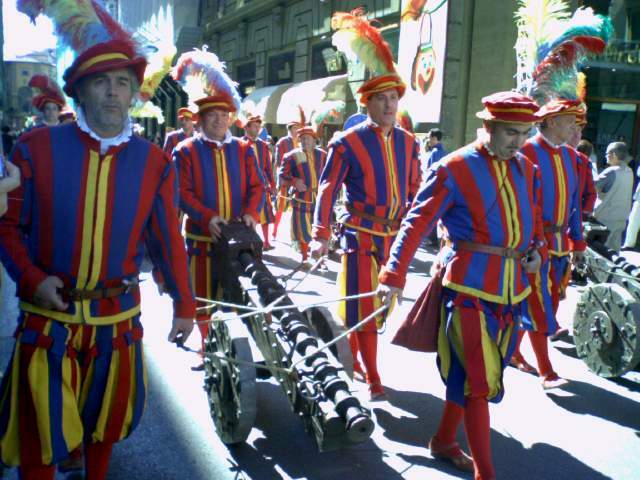 For this reason the Calcio Storico Fiorentino is a real tradition, deeply-rooted in the city social structure. Another good opportunity to spend some days in Florence and be part of tradition, profiting from our large selection of accommodations right in the centre of town, among which some right on the corner of Piazza Santa Croce. Questa voce è stata pubblicata in Culture and accommodations in Tuscany, Folklore and accommodations in Tuscany, Tuscan lifestyle e contrassegnata con calcio storico fiorentino, Florence, Santa Croce church. Contrassegna il permalink.